OKAY. For a Kdrama Fan, I am too late for this review because I just watched it the other day. Uh-oh. The plot is simple and very light to watch, no grudges or whatsoever although there are villains in the story (not new to a Korean flick) but they are not much to hate compared with other dramas' villains that would make your head ache. It all began during the Joseon Era, a Korean dynasty dated 300 years back from the modern time when the Crown Prince is all set to find the "love of her life". Crown Prince Lee Gak (the super in love) is then married to the Crown Princess Hwa Yong. Hwa Yong has a sister named Bu Yong who became their assistant in the palace. Bu Yong was supposed to marry the crown prince but her sister, Hwa Yong accidentally/intentionally burnt her face with an iron. While they were doing the investigation, they found a clue that the answer is somewhere hidden in the middle of the forest. 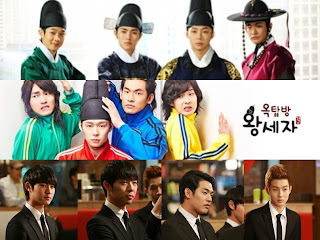 They went there together with prince Lee Gak but to their surprise, a group of bad people started attacking them. They rushed their horses to get rid of the arrows that were being thrown to them only to find out that it was a dead end... Fast forward to the 21th century... *()$&@@".,?! eeeck* next thing they knew, they were in Park Ha's (Bu Yong's reincarnation) rooftop. 1. 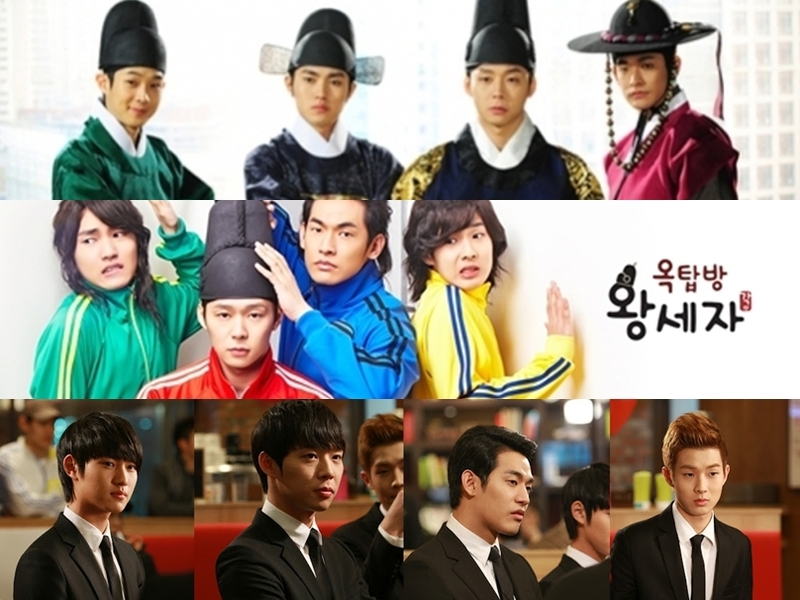 The story of the Rooftop Prince is not common. It is indeed full of surprises, u-turns and even great revelations. Although the cast are multiplied in each episode, all of them were relevant in every scene. Hmm, except for Mimi and the other housemate of Park Ha, which I don't know what happened to them. But generally, it caught the viewers' attention. Also, the connection (story) that took place in Joeson and the 21st century was given justice. The director came up with a good ending. For that, I will give it 4 stars of 5 being the highest. 2. The happy scenes are just irresistible. From the bodyguards to the love team, it was full of passion, love and excitement except for the villains of course. Tae Yong and Park Ha are just two lovely couples. They give me reasons not to put down my iPad every time they are on que. I just fell in love with the thought that FATE would bring you to the person who's really meant for you even it would take a hundred years or forever perhaps. Aww! Although they aren't even part of my favorite KDrama couples, they definitely pulled it off. Now, they are on my list! I love them so I'll given them 4.5 stars. 3. The office set-up and family connection. Hmm, a bit okay. Some scenes were a bit off and I just can't connect it with the whole plot. It took so much time in the drama and it kinda bores me at some point. 3 stars for the effort. 4. The villains were kinda "trying hard" to play the witch part. At some point, I hated Se Na and Tae Moo but most of the time, they irritates me. They do things repeatedly. Hello, writer! :) 3 stars again. 5. Lastly, the OSTs Hurt and Happy Ending were perfect! Nonetheless, I enjoyed watching it and I hope you would too if you haven't seen it yet. I can guarantee that after watching the whole series, you would feel like watching it all over again (like I did). Disclaimer: I don't own the photos, just got it from the real owners via their respective websites. Thank you. Have you watched it already? Tell me what you think! Other recommended k-dramas: Full House, You're Beautiful, Boys over Flowers, To the Beautiful You, Coffee Prince, Princess Hours/Goong, City Hunter, Personal Taste/Perfect Match.. to be continued *still recalling*. I agree with you, a lot of points I agree with. Yes, I hated Tae Moo and Se Na, being to nervous and not that realistic. They were over acting. The villains acting was, yeah, I was annoyed. Lol, I was looking at other reviews and your review is similar to mine that I'm writing right now! Thank you for dropping by, Cerise!